Congratulations! You will each receive one copy of The Grand Paradox. Please send me your mailing address using the contact page. In my former life as a book publicist, I got to know a man named Ken Wytsma. Ken is an author, a pastor, a husband, a father or four girls and he founded a rather large annual gathering called The Justice Conference. One week in the cold of February, Ken and I traveled to Pittsburg, where he had some media lined up for his first book Pursuing Justice. My job was to drive us around and make sure we were on time and Ken was prepared. This is always the job of a book publicist when traveling with an author. I am not so great at directions and was nervous to be driving around Ken Wytsma because he is kind of a big deal. Because of this, I got lost going to almost every destination we needed to get to over the course of two days. We spent more time in that rented SUV driving through mysterious roads in the snow than we did doing interviews or being indoors. At some point Ken took over the GPS, which really hurt my publicist pride, and we started arriving at our destinations much more quickly. Even though Pittsburg was kind of a fail logistically, it did give me an opportunity to get to know this author/pastor/conference leader man, and I’m so glad it did. Ken truly lives out his life message: that justice is central to the gospel, and in order for us to know God’s heart, we must seek justice for all of His people. Right before I left my publishing job last fall, I got a sneak peek at the manuscript for Ken’s new book The Grand Paradox. I read 20 pages and wanted more. The book finally released a few weeks ago, and I was not disappointed by the other 180 or so pages. If I had to pick a favorite part about The Grand Paradox, it would be the way Ken talks about the will of God for our lives. As a millennial, I am obsessed with God’s will for my life. As Ken points out, this type of fixation popular in current Christian culture is not helpful. Not to us as individuals and not to God’s big, overarching will for humanity. “We all like to think God’s will for our individual lives is to write us into the story as the central character,” writes Ken (p. 82). Yep, I like to think that most days. That God is going to do HUGE things through ME. Ken goes on: “Instead of asking what God’s will is for my life, I should be asking how I can serve God’s will with my life….God doesn’t promise that all will play the central character. What God does promise, however, is that He will love all, lead all, meet us all, and provide guidance and wisdom needed through the Holy Spirit to find, rest in, and follow His leading in our lives” (p.85). I am incredibly guilty of trying to decipher God’s perfect will for me, my exact next steps to take. This has paralyzed me in decisions and caused great guilt and fear that I made, or will make, a wrong move. God has been gently freeing me of this mindset lately and reading Ken’s book came at the perfect time to affirm the truth that discerning God’s will does not have to be a hard and scary thing. In fact, if it feels that way, I’m probably trying to make myself the central character. I’m probably thinking that I’m a way bigger deal than I actually am. I’m doing something today that I’ve never done before, a giveaway! 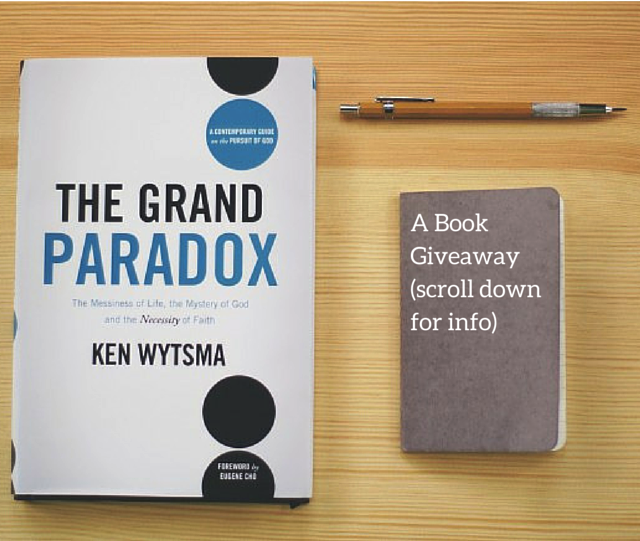 I have four copies of The Grand Paradox to give away to four lucky recipients. Leave a comment below and consider yourself entered into the drawing. On Thursday, March 12, exactly one week from today, I will collect all commenters’ names and select the four winners. I’ll then announce the winners via my Twitter and Instagram accounts. So follow @AndreaLucado and/or @AndreaLucado to find out if you won! So true. I have been sick a year and three months now, so much so that I am unable to do music like I believe God wants me to, let alone work at any job. There have been many frustrating moments, a lot of them stemming from my idea that God can use me and my songs to help others. Sometimes, I feel like I am wasting time being stranded at home rather than being out there doing God’s work. The reality is, God can use and has used this trying and difficult time to bring glory to His name, rather than mine. A lot of times I have to remind myself that I am not the Savior of the world. Jesus is. Whether I am out there or in here, he will be glorified in every circumstance. I, too, am giving books away on my blog! (Worship with Words) This week someone will win Jan Watson’s “Buttermilk Sky”! While I’ve not been a book publicist, I was blessed to help w/ the Book Club @ SEC for 7 years and enjoyed meeting and usually feeding loads of authors which was a blast. Would love to read his book! I’ll pass on this information! As a servant of God I want to know how best I can use my limited resources to be of maximum impact for others to draw closer to God. In the name of Jesus I’d love to have a copy of this book. Blessings! Andrea, bless you for that post, I needed it today. God works billions of small miracles every day, and this was a reminder I’m not alone in my struggle of the moment ;). God is good! This book would definitely enhance my 90 day focus! It’s always about what God wants and never about me. This sounds like an awesome book. This is a perfect book to study with our college aged small group. This is powerful. I was just sitting under a shade this afternoon and the Spirit of God just whispered something to me that seems like this excerpt. The Spirit of God said to me ‘if you are truly a PENCIL IN GOD’S HANDS, then you must be of no reput and glory because however and whatever is written through the pencil, people do not seek to know the pencil used but the work.’ It show we must truly not be in leading character to believe we are living in God’s will. Never heard of Ken. I’m looking forward to tras his Book. Andrea, God blesses your readers with His words. Thank You, Lord Jesus for the gifts You’ve given her. Unfortunately my legalistic mind and my pride lead me to spend a lot of time searching for my special task in His will and sometimes that has me missing the forest or the real opportunity to be in His will right where I am. Thanks for sharing this. Have you ever felt rejected? Ever felt abandon or forsaken? All by God. I have. It is an awful place. God has Joy, Peace, … for all those who seek Him… with their whole heart! Complete surrender can be painful and I can’t have what I want, when I want it, all the time. His Will is perfect and I can’t wait to read and see how he weaves Justice into God’s will and Love. What a great counter to the “follow YOUR passion”, be-first movements! HE first. Appreciate the insight. I also scurry around thinking I have a bigger part. Many times I feel inadequate for the race. God still shows me time and time again. I can be a part of, I am not to broken for the part. Actually, I am being designed and whipped into shape for me to just do and participate in his will. Great post! Thanks for the giveaway! This has been my thoughts for years now. Being a Christian that used to handle a network of young believers some challenging years ago. While doing so, having a reputation and all, people who follow and listen to whatever I may say, “stage passes” with a pulpit and a bible, things got a little out of hand–out of the hands of God that is. Since then, I have proven that God has His wondrous ways to correct & rebuke the ones He loves. I lost those “glamour”. Of what supposed to be God’s glory. And since then, I was always trying to gain the trust of my leaders(my pastors who saw a potential in me to be used bt God). To earn the trust of the One who gave it all. Oh that He may use me again mightily. Until prayers have become a thin line between praying for the will of God to happen in my life and to just bring it all back to me I promise I won’t waste this chance kind of prayer. Over the years, it has just been all about me, that the will of God may serve me and not to serve Him in a way He willed it for me. Oh that I may serve the cause of Christ again. in purity. Very interesting sounds like the book will be a very good read. Had not thought that my struggle was that I was making myself more if the main character than I really am. I enjoyed this blog Andrea. I really like the thought: Instead of asking what God’s will is for my life, I should be asking how I can serve God’s will with my life…I never thought of it that way. Changes my thinking! As a fellow millennial obsessed with finding out what God’s will is, this post hit home. I foolishly think that even the smallest misstep will disqualify me from His plans, that if I don’t get this perfectly, it’s game over, but He likes to smash my “God box” from time to time and remind me that He is not limited by time, resources, or any facet of humanity. As a fellow millennial obsessed with finding out what God’s will is, this post really hit home. I so often believe that even the smallest misstep can disqualify me from God’s plans, that if I don’t get this perfectly, it’s game over. Thankfully, He likes to smash my “God box” from time to time and remind me that He is not limited by any facet of humanity: time, resources, or my inability to be perfect. Most every day I get anxious that I am not part of something huge in that moment, but God has the love and grace to remind me every day that even the smallest of things – being a loving husband, speaking His word to someone unexpectedly, allowing yourself to see His creation – is sometimes exactly His desire for you today. He’ll worry about that huge thing tomorrow and get you to act when He needs you to. Looking forward to reading this book – sounds fantastic. I would love to read this book…Thanks! It was exciting to see you tackle and endeavoring to know God’s will. Haven’t we all been there? I don’t believe it has anything to do with you being part of the millennium generation. It truly can occur in any generation. None of us are exempt from wrestling with knowing God’s Will in our life. we realize when we walk in the sunshine. Andrea, keep on writing. BTW it is interesting to see that you admit to being a millennial. When you talked about feeling paralyzed in making decisions when trying to decipher God’s will, it really reminded me of my daughter. She’s in her first year of college and there have been several times when she has struggled to know God’s will and make decisions. I would love to give her this book, I think it would be so helpful for her! Thank you. What great words of truth. Thanks for sharing! Andrea, thank you for quoting Ken’s book, I needed that reminder this it is HIS will! Sometime we all forget! Cannot wait to read the entire book…think a trip to Family Christian Bookstore after work is in order; I could wait a week to see if I win a copy but I am too excited to dig in! Andrea, I enjoy your articles. You are your father’s daughter, blessed with a gift few have. Keep up the sharing! This post was so timely! Thank you so much!! Just over a year ago we moved one state over for my husband’s job. He took over 6 months to decide whether or not to take this job- in an attempt to “decipher God’s Will” for our family. We took a leap of faith and took the job- leaving behind our life of 15 years- our home, schools, (we have 3 children) friends, etc. We have been here over a year now, and my husband is miserable in his new job. Again, he is agonizing over getting “His Will” right- and just this week has interviewed for a different job at the same company back where we were. We are looking at going back- and struggling to decipher if it is “God’s Will.” We have spent 2 years now in this dialogue and space. It has stressed my husband to no end. I have forwarded this post to him and I KNOW it will speak to him in profound ways. Thank you so much! His birthday is next Thursday, March 12th. Would love to win this book for him! Otherwise- I will definitely purchase! Thank you, thank you for your timely words! Andrea, thanks for your writings. I have begun printing them the night before I substitute teach and take them with me to read at work! So insightful and inspiring for me! This book sounds great! I have tried to ask God to place me where I can serve Him and show Him to others. Sounds like this book could be an incredible encouragement! Well, it doesn’t appear that I am soon enough for a free book, but I’m going to find it and read it anyway. Great post, Andrea. It is easy to enjoy and be inspired by your writings, Andrea. Thank You. This would be awesome to have for me and my husband to read together! Thank you Andrea. I have been fixated on finding God’s will my whole life. This helps me so much. I’m putting this on my to-read list regardless of if I’m a lucky winner. Thank you for sharing! What a wonderful perspective on how to get our priorities straight. Thank you for sharing this information. For the book in case I don’t win and will pass it on to my niece, Callie Settles, who is serving with PAIS. Sounds like an WOW book! I try and read and pass on books. GOD is so great and has a great plan for our lives. It’s a bitter pill for most of us to swallow that we are not the center of the universe. Some forms of the gospel being preached today unfortunately, affirm this type of thinking. We’ve been discussing this exact thing in my Bible Study group! Would love to read his thoughts and share with the group. This sounds like a thought-provoking book that I would like to both read and share! The depth of your writing grabs and holds my attention. I’m grateful for your inspiration. It motivates me to focus much more differently on others and on our Heavenly Father. I’m grateful for that too! Sounds like a great book offering a fresh perspective on God’s will. Would be glad to have it. God bless you. He always knows what is best for me. Very interesting. I went back to school in my late 30s to become a nurse practitioner – definitely more my calling than advertising and I am very thankful and have a lot of peace. However now that my daughter is nearing college-age, I think she and I both strongly feel that fear of getting it right and doing God’s will. These thoughts you mention make perfect sense. Definitely going to read the book. Thanks. Thanks for sharing your experiences and the book. I have a form of ALS that keeps me in a power wheelchair. The same question comes to my mind often and today, a new idea for a way to serve God “popped” up twice. Since I am eye high to kids and have a permanent smile, public places give me an opportunity to bring cheer to children with high fives and fist bumps for the brave and smiles for the timid. While my speech is garbled, my sense of contentment and peace with my circumstances speaks volumes by the grace of God. Kids may be my target audience, but no adult will be denied. Again, thank you. And btw, I am a friend of Buck at OHC. This sounds like a great book (and a great trip to Pittsburgh–even if your pride hurt a bit… sometimes those turn out to be the best trips). Thanks for the recommendation! I would love to read this book! I have struggled with this idea of God’s will most of my adult life! And the little excerpts you shared gave new perspective! Thank you!! I really enjoy your blog. It reflects my own thoughts about life and has encouraged me. Thanks! Me! Me! I talk a lot about God’s will with the girls I minister to, and for a while now it’s been feeling a little empty, like there’s something I’m missing. It’s not just American millenials who assume the starring role. 😉 I’d love to read someone else’s thoughts on reframing it. As always, Andrea, LOVE what you write. Can’t wait for your book to come out…I’ll even buy it! Won’t even wait for a giveaway!! What a privilege to see the love of God through Ken’s book. A sweet reminder our lives are for God’s purpose. Andrea I always enjoy your articles. You are a great writer and I love the way you speak from your heart. I am from the Nashville area. I hope you are loving Nashville and all it has to offer. I know you love coffee shops. Hope you have tried Crema in the downtown area. I can’t wait to read the book. This would be an invaluable tool for all ages. Sounds like a great read. I have to remind my heart of this daily! Work in progress. Thank you for this post. I saw a post by you and Chris Tomlin and wanted to find more about who you are. Don’t know that yet. But am thankful that I found this posting. May God richly bless you as you seek to share Him. Proud of you, Dre. This sounds like a great book! I loved your last quote from him — it reminds me of when I heard a speaker talk about how we get so stressed about the “will of God”, but God makes his will known to us — love God and love others. It’s humbling and comforting — and simple! Loved this! Great perspective on God’s will and being Kingdom minded, not self-minded. Needed that reminder today. Thanks. I am enjoying your blog. This book is on my list.